"With two picky eaters who LOVE sloppy joes and an overabundance of green peppers from my garden, I came up with this family favorite that also incorporates more vegetables into their mealtime!" Mix tomato sauce and sloppy joe seasoning together in a bowl. Finely chop the usable 'meat' from the removed tops of each red bell pepper. Heat olive oil in a skillet over medium heat; cook and stir red pepper pieces and garlic until fragrant, 1 to 2 minutes. Cook and stir ground beef and 1/2 cup beef broth into the red pepper-garlic mixture until ground beef crumbles are browned, 8 to 10 minutes. Drain off excess fat from the cooked ground beef. Add instant rice, 1/2 cup beef broth, and Worcestershire sauce; stir to combine. Simmer until the rice becomes tender and absorbs most of the liquid, about 10 minutes. Add about 1/2 cup of the tomato sauce mixture, 1/2 cup Parmesan cheese, salt, and black pepper to the beef mixture; stir to combine. Ladle about half the remaining tomato sauce mixture into the bottom of the prepared baking dish. Stuff each of the red bell peppers with ground beef mixture; arrange in the baking dish. Ladle the remaining tomato sauce mixture over each bell pepper. Cover the baking dish with aluminum foil. Bake in the preheated oven until filling is cooked through, about 25 minutes. Sprinkle remaining 1/2 cup Parmesan cheese over the peppers. Bake until cheese is melted and bubbling, about 10 more minutes. You can also add 1/2 cup of cooked rice to the beef mixture just before stuffing the peppers. Omit the last 1/2 cup of beef broth if you do this as the mixture will become too soupy. You can use all red bell peppers, or all green bell peppers, or mix and match. This recipe is definitely a keeper. 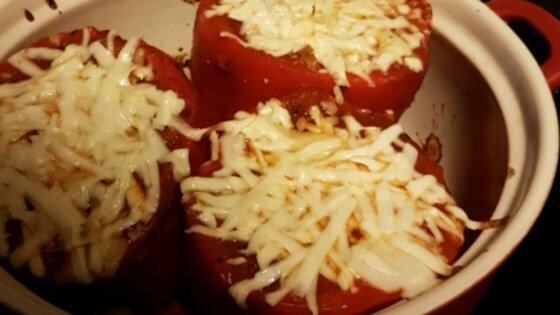 One of the best stuffed pepper recipes I've had in a long time.